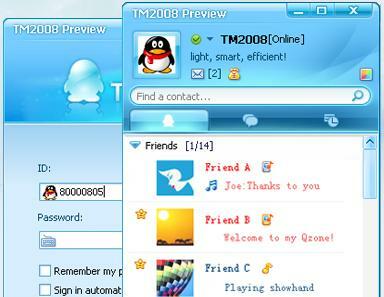 Tencent messenger is also an IM tool developed by Tencent. Unlike Tencent QQ, it is much widely used in internal communications among enterprise staff members. Also, it is better considered as an instant messaging tool loved by familiar. In many companies, Tencent messenger is the first choice for chats between employees. But how to ensure that the employees are not using the software for other non-work related chats, it will be depended on the powerful IM monitoring software. How to monitor Tencent Messenger with Surveilstar? Step1: Download and install Surveilstar to computers. Please note: the agent only needs to be installed on the monitored computers while the server is advised to be one. If more than one are installed, the data may not be complete. Because they perhaps are sent to another server. You can also set multiple consoles and assign different user privilege. Step 2: Enter the console, click "Monitoring" button on the monitoring toolbar. Select "Instant Message". There are 3 options for "Monitoring"- "Screenshot", "Email", "Instant Message". Step 3: The details of Tencent Messenger chat will be recorded and you can view it by clicking the item. Participants, time and other details will be listed too. Block Tencent messenger by setting "Application Policy“, the "Properties" at the right bar can enable you to set policy details. Try Surveilstar employee monitor to start your employees' Tencent messenger monitor now!